If your organization is not accepting credit cards onsite—for adoption fees, donations, spay/neuter or vaccination fees, boarding costs, service payments or anything else—you’re missing out on a big source of revenue. People have started to expect the convenience of being able to use credit and debit cards, and we need to meet our customers’ expectations! When someone pays with a credit card, you know immediately whether the payment will clear—unlike a check, which may bounce a week later and you’re never able to recover those funds. Yep. It’s true that whenever you accept credit cards, you will have to pay fees. There’s no way to escape it—and every merchant pays fees. In this day and age, it’s truly just as cost of doing business. BUT—you have a lot of control over how MUCH you pay in fees, and you can do that by educating yourself. Plus, the overwhelming majority of organizations find that once they start accepting this additional form of payment, their overall revenue increases significantly—more than enough to offset the small fees incurred. The best part is, accepting credit cards is SO much easier than ever before. Several different services exist and offer similar technology and services, but the fees are different. 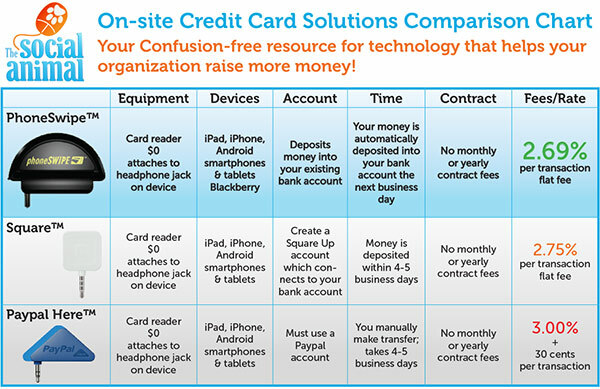 Here’s a comparison of the top three – PhoneSwipe™, Square™ and Paypal Here™. They work with all iPhones, iPads, Android tablets and smartphones. They don’t have any monthly/yearly or recurring fees of any kind (you only pay if you make a transaction). The equipment (card readers) for each is free. I have used all three extensively, in the animal rescue field. I recommend PhoneSwipe, hands down. Here’s why. I find Paypal difficult to deal with, and I don’t like it that I have to manually go in and request my money be transferred to my bank account…and then wait a week for that to happen. Their reader is tricky to position the card just right to get it to read. Paypal’s rates are also higher than any others. Accounting is confusing enough to me…having a separate Paypal account and bank account is a hassle. With Square, the card readers are small and flimsy; the thinner plastic part breaks at the slightest provocation, meaning you have to buy new readers. While it does transfer my money automatically into my account, it still takes about 5 days to do that. PhoneSwipe has the sturdiest (but still lightweight compact) reader unit by far, and it’s easiest to swipe the card through it. 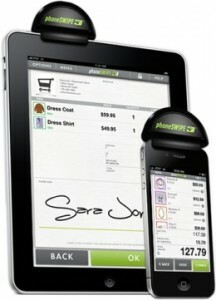 It’s also compatible with Blackberry smartphones and integrates with Quickbooks. PhoneSwipe has the lowest rate of any of these products, and even though it’s just a couple of percentage points different than Square, that can really add up over time. There’s also no “minimum” you have to do each month to qualify–if you only use it to make one transaction per year, that’s no problem. And you don’t need to be a 501(c)3 to qualify for the low rate. When you chose PhoneSwipe, you save money on every transaction, putting more of YOUR donations to work for the animals in your care. If you have any questions, please don’t hesitate to ask. You can reach me by email at Emily@thesocialanimal.com or by phone at (405) 445-4442. Ready to sign up for PhoneSwipe? The application takes about 3 minutes, is totally secure and you’ll get your welcome kit and reader packet in the mail in about 3 days! Just plug in, download the app, and you can start accepting credit cards immediately. I got the following message when I hit your “apply” button. Thanks for letting me know, Sally! I will fix it; in the meantime, go here: http://www.nonprofitdonations.org.